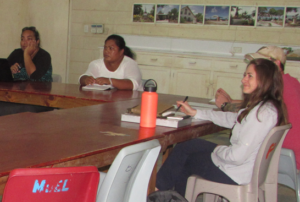 15 March, BTC Boardroom – The Betio Town Council’s proposal to establish a museum to house and display WWII artifacts and other cultural remains in the Japanese bunker near the High Court, came closer to fruition with a meeting of the key stakeholders that included the Kiribati National Tourism Office (KNTO), Cultural Division, History Flight, LDS Church, BTC and KiLGA. The Committee was chaired by the BTC Mayor, Tauia Taoaba and comprised Mr. Salona Resture (LDS church) Dusty Rather and Hillary Parsons (History Flight), Eera Teakai (Cultural Division, MIA), Ereata Benson, (Kiribati National Tourism Office) Mikari Ooka (BTC Clerk) and Rikiaua Takeke, (KiLGA). The LDS church is a key partner as it owns a portion of the land where the bunker is located and has agreed to fence off the area and carry out landscaping works at the site. History Flight, the NGO carrying out excavating works for US soldiers’ remains on Betio, has also agreed to provide some support to the museum including artifacts dug up on Betio. The Committee agreed to hold more meetings to decide on a timeline of activities.